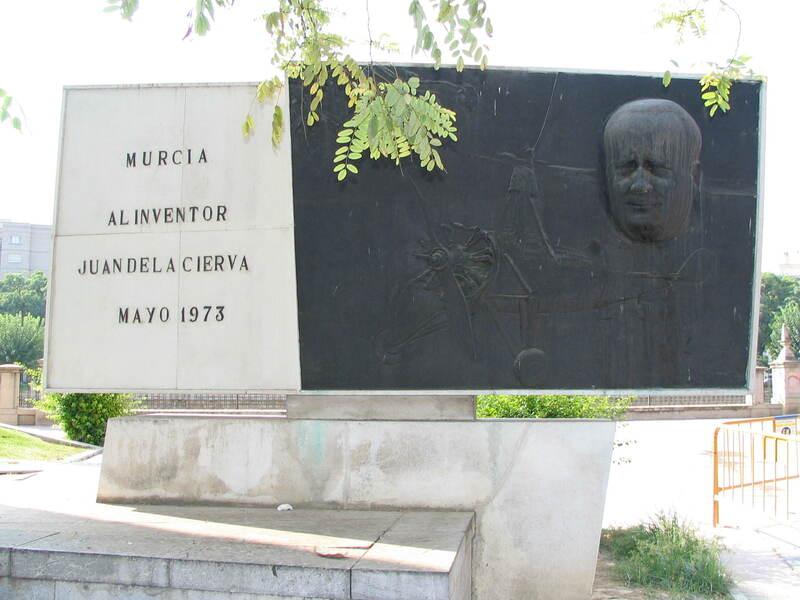 Juan de la Cierva was born in Murcia on the 21th september 1895. His first gyroplane flew in 31. January in 1923 at the airport Cuatro Vientos, close to Madrid. Table of contents about all our records of jouneys to Spain. With briefly over 1/3 million inhabitants Murcia is the busy capital of the region Murcia. Even though the climate is, actually, ideally for cycling, warmly and dry, it is driven in Murcia almost only by the car. With cycling Spain is a 1/4 century behind. Several exactly same looking bridges are in Murcia in order to cross the river Segura. The water has on the 18th of September nearly 30 degrees and flows very slowly. The monument is directly on the river Segura in the city center of Murcia. On the 28th September, 1928 Juan de la Cierva with his gyroplane crossed the English Channel. The pioneer of the today's helicopters died on the 9th December, 1936. 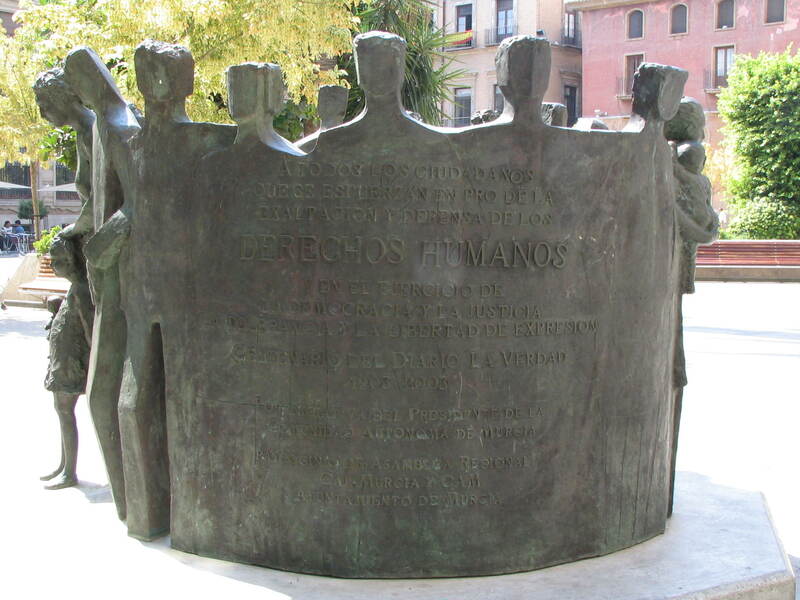 This is the abstract sculpture part of the 3-part monument in Murcia. After 1238, Murcia occupied by the Moor was recaptured, the mosque was substituted in the 14th century with a Christian cathedral. In the entrence area the back of the big organ and a Marien's shrine. High altar and the high dome of the cathedral. Only to take photos with flashlight is forbidden for the protection of the art treasures. Completely without flash and with tripod one may. In the center of the cathedral there is this tomb. Behind it the big church organ. Fountain in the right side of the cathedral with details of the outside wall. As if one was some 100 kms farther to the south in the Arabian space the foyer of the Cainos looks like. Murcia was conquered also once by the Moor. Detailed exposure of the vase in the foyer of the casino. Heavenly scenes happen on the ceiling. A case for tiltable display of the Canon S1 : the camera is laid on the ground, the display is turned upwards. In the narrow lane of the city center it is not to be placed simply the facade of the casino in the picture. The church Santo Domingo was built in the 18th century. So one would have expected a tree rather in moist Germany than in the sunny south of Spain. It is the dominating appearance on the place Santo Domingo. The trunk runs apart down strongly, thus as 2 ms would already begin above ground the extensive root system. On the place Santo Domingo the monument of the human rights is also. The Spanish inscription becomes light readably if you look at the picture in high resolution. Yes, there is it still, the tiny shop around the corner. Here discovered in the city center of Murcia near the shore of the Segura.